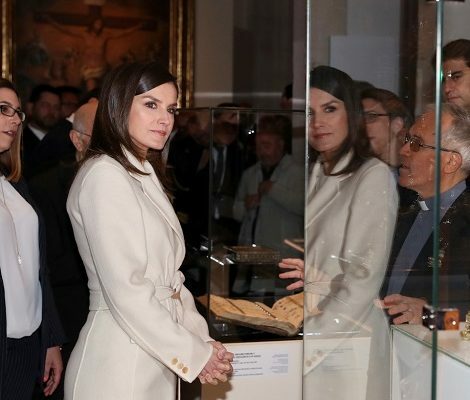 Queen Letizia of Spain was in her hometown Oviedo to inaugurate the summer courses of the International School of Music run by Princess of Asturias Foundation. The musical inauguration ceremony took place in the Auditorium of the Prince Felipe Congress Center in Oviedo. The International School of Music of the Princess of Asturias Foundation is the consolidation of a project initiated in 1990, when the Princess of Asturias Foundation sponsored the transfer of prestigious chamber orchestra Los Virtuosos de Moscú and six outstanding professors (Gaiane Pogossova , Tsiala Kvernadze, Alexei Mijlin, Alexander Fedorchenko, Victor Afanassiev and Yuri Nasushkin) to Oviedo. Since then, the support of the Princess of Asturias Foundation for the teaching and orchestral musical activity of the Principality has intensified with the support of numerous pedagogical initiatives, some of them directly created by members of the team of professors of Los Virtuosos. After years of collaboration, in 2005, on the occasion of the celebration of the XXV anniversary of the Prince of Asturias Awards and picking up the initiative of Yuri Nasushkin, the Foundation created the International School of Music. The classes are taught by a prestigious international faculty and the School has the participation, as guest lecturers, of some of the most outstanding musicians in the world, among which are figures awarded with the prizes that the Foundation awards annually. Upon arrival at the Prince Felipe Congress Center, her Majesty the Queen was received by the President of the Principality of Asturias, Javier Fernández. The Summer Courses are taught at the Superior Conservatory of Music “Eduardo Martínez Torner” and at the Prince Felipe Auditorium in Oviedo, from July 19 to 28. Each professor has pedagogically selected the criteria, methods and teaching materials that are applied in the classes. The students enrolled in the instrument classes receive at least five individual and five collective classes (departments of Key, String and Wind Wood). The students enrolled in subjects of the Canto, Wind Metal, Direction and Composition departments have comprehensive courses. Those who want to attend as lecturers to their teacher’s classes may do so, as many times as they wish, without interfering in the dynamics of the class. The ceremony started with the video summary of activities took place at the summer school throughout the year 2017. A paper “This is not a conference” was presented by the artistic director of the Arriaga Theater, Emilio Sagi. Then a musical performance was presented by the students of summer school. Through summer courses, master classes, as well as conferences and seminars, the School is committed to turning the Principality of Asturias into a national and international reference in musical education, bringing young talents and the best musician specialists to Asturias -instrumental Finally, Letizia attended the performance of the activity “Micro-theatrical concerts”, dedicated to the composer Ludwig van Beethoven, in charge of a student of the piano course who performed a musical fragment while reciting a short monologue related to the music and the composer. 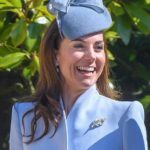 Every year Letizia brought the elegance to the event with her fashion sense. This year again, the 45-year old Spanish Queen did not disappoint us. 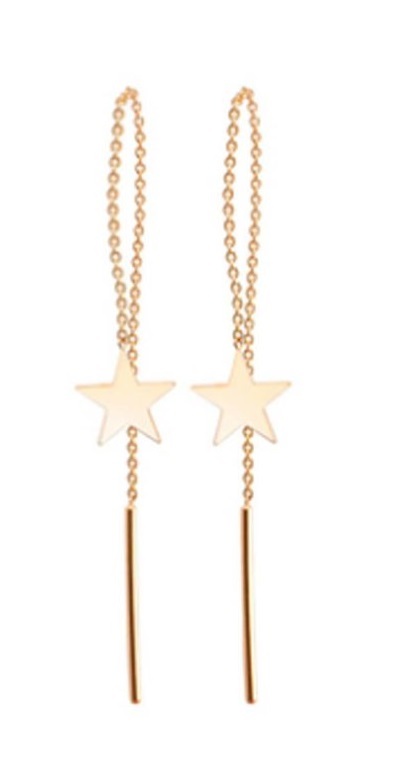 She premiered a new dress from one of her go-to labels Hugo Boss. 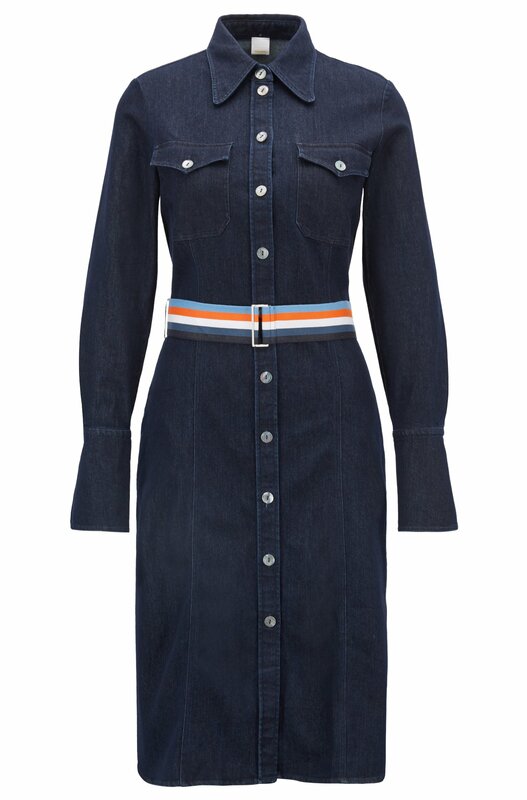 Letizia was wearing dark blue ‘Caddli’ Stretch-denim dress with bell cuffs and ribbon belt. Giving her own touch Letizia wore the belt of the dress inside out. 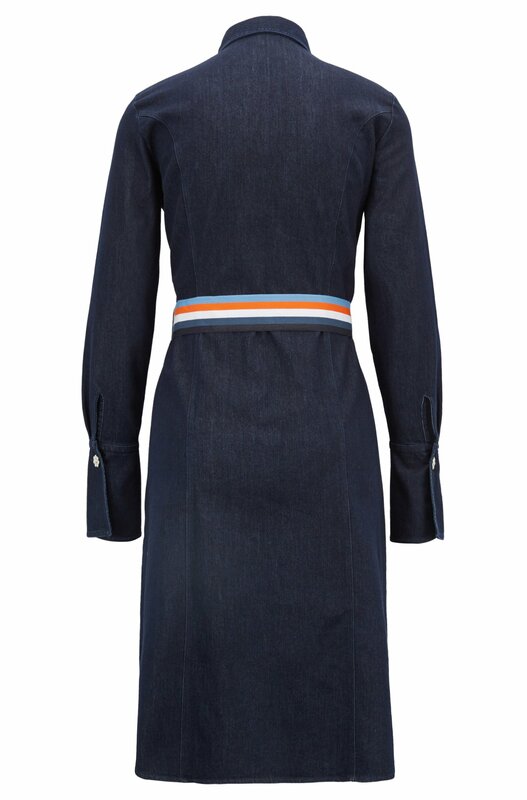 A vintage-inspired dress in indigo stretch denim by BOSS Women’s wear is cut to a slim fit features authentic details including rounded shirt collar, twin chest pockets and a front-stitched placket, playful bell cuffs, decorative buttons at the cuff and a detachable ribbon belt for a vivid pop of colour. 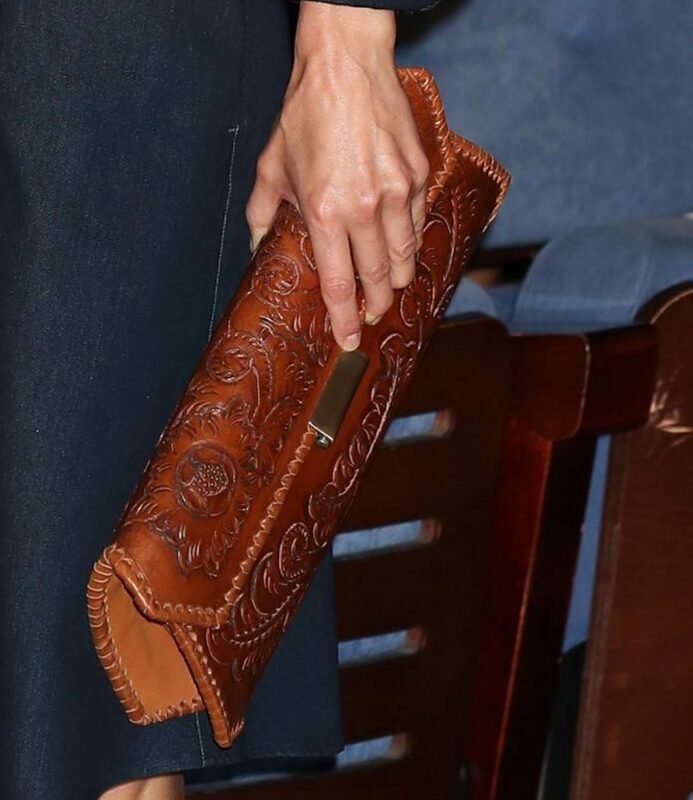 Letizia was seen carrying an embossed leather camel clutch that she has in her wardrobe for many years but the label of the clutch is still unknown. Letizia has opened the summer school courses every year since 2013, every year giving us a different look perfectly suitable for the artistic event. 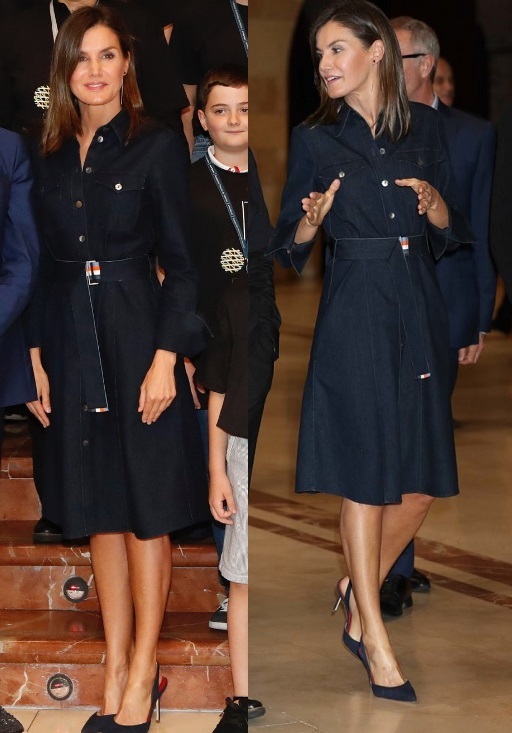 A look back to Letizia’s previous year’s style for the opening of summer course. 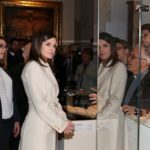 I like Letizia’s style. 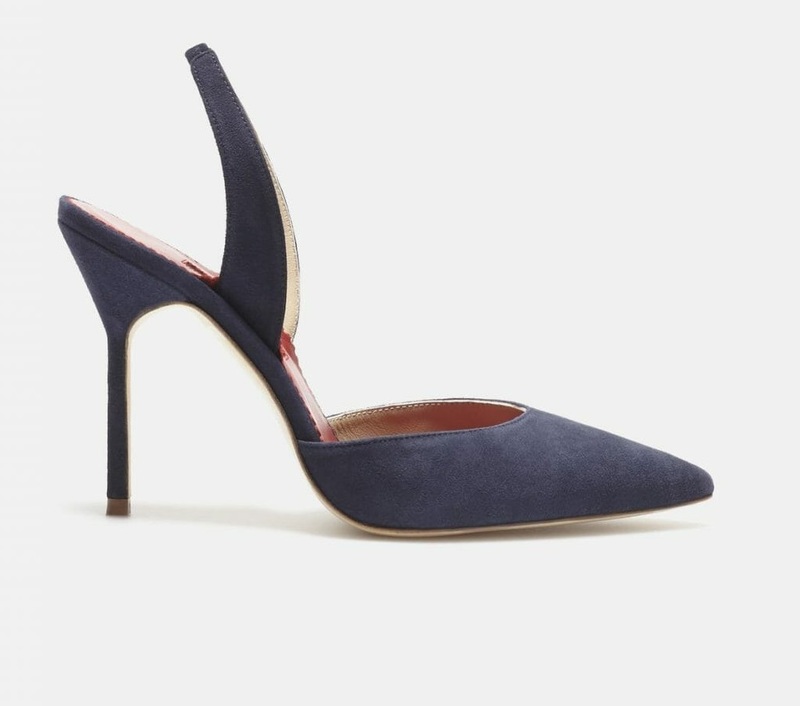 Its chic, emulatable. I love how she never goes for the ultra high end haute Couture. Yes she wears runway pieces but none of them screams extrme richness.